Each year the holidays bring with them an increase in both the consumption of alcohol and concern about drinking's harmful effects. Wine was invented 6,000 years before the birth of Christ, but it was monks who largely preserved viniculture in Europe. Religious orders such as the Benedictines and Jesuits became expert winemakers. They stopped only because their lands were confiscated in the 18th and 19th centuries by anti-Catholic governments such as the French Revolution's Constituent Assembly and Germany's Second Reich. "Brothers, come quickly. I am drinking stars!" 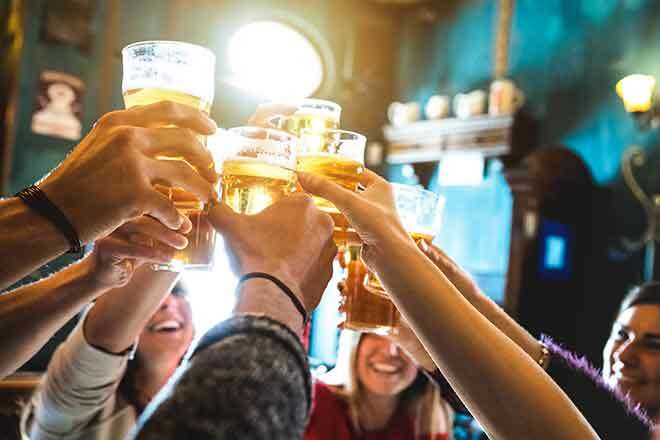 And although beer may have been invented by the ancient Babylonians, it was perfected by the medieval monasteries that gave us brewing as we know it today. The oldest drawings of a modern brewery are from the Monastery of Saint Gall in Switzerland. The plans, which date back to A.D. 820, show three breweries - one for guests of the monastery, one for pilgrims and the poor, and one for the monks themselves. One saint, Arnold of Soissons, who lived in the 11th century, has even been credited with inventing the filtration process. To this day and despite the proliferation of many outstanding microbreweries, the world's finest beer is arguably still made within the cloister - specifically, within the cloister of a Trappist monastery. Chartreuse is widely considered the world's best liqueur because of its extraordinary spectrum of distinct flavors and even medicinal benefits. Perfected by the Carthusian order almost 300 years ago, the recipe is known by only two monks at a time. The herbal liqueur Benedictine D.O.M. is reputed to have been invented in 1510 by an Italian Benedictine named Dom Bernardo Vincelli to fortify and restore weary monks. And the cherry brandy known as Maraska liqueur was invented by Dominican apothecaries in the early 16th century. Nor was ingenuity in alcohol a male-only domain. Carmelite sisters once produced an extract called "Carmelite water" that was used as a herbal tonic. The nuns no longer make this elixir, but another concoction of the convent survived and went on to become one of Mexico's most popular holiday liqueurs - Rompope. "O Lord, bless this creature beer, which by Your kindness and power has been produced from kernels of grain, and may it be a health-giving drink for mankind."